Throwback Thursday! 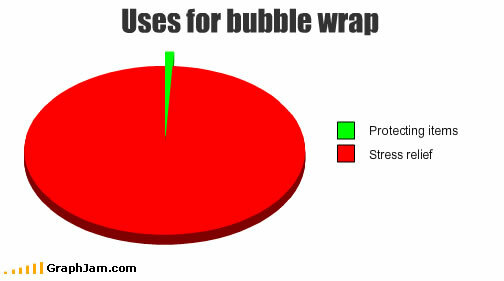 Should We Bubble Wrap The World? This was very popular the first time I posted it. In a rare moment of clarity for me, I actually got a little philosophical. I hope my new readers enjoy it as well, and if you didn’t see it before, it’s new to you! And seriously, if the bubble wrap picture from Friends doesn’t get you to read this, you’re dead inside. 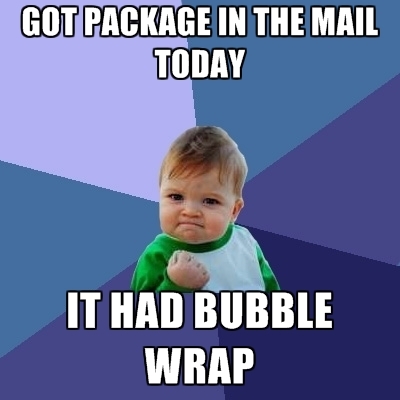 We all love bubble wrap right? What we love about it is popping the bubbles, right? (Does anyone not see a metaphor coming?) In a post a few months ago about the idiot that petitioned Facebook to remove the “feeling fat” emoji, I said that “nobody’s going to bubble wrap the world to make it safe.” In fact, I don’t want anyone to make the whole world perfectly safe. As I was saying, when I was a kid in the 1970’s it seemed that our parent’s, all of ours, not just mine, didn’t really worry too much about our safety. Seatbelts? We didn’t need no stinkin’ seatbelts! I remember once when some of the kids in the neighborhood went to a summer day camp at the elementary school. When my mom came to pick me up she offered a ride to my friends from the neighborhood. Ten kids crammed ourselves into a Ford Mustang! Not a one of us had a seatbelt or an airbag. Other times I remember kids riding in the open back of pick up trucks. You just held on and hoped there weren’t too many bumps. That’s kind of a metaphor for life, isn’t it? In the 1970’s so many of us were allowed to go home by ourselves after elementary school that they made up a phrase. We were called latch key kids. Nowadays there’s before school programs and after school programs so that every minute of children’s days are supervised and bubble wrapped. As kids that directed our own time, we learned about the world on our own and used our imaginations to come up with solutions. Sure, sometimes kids broke an arm or a leg, or once my sister tipped over a deep fryer of scalding hot cooking oil on her arm, but those were life lessons and mistakes we didn’t make twice. Even bullying was allowed in the 1970’s! Everyone who thinks that cyber-bullying is the end of the world, guess what? Back when I was a kid we bullied and got bullied in person, face to face. I think that’s got to be a lot more traumatic than idiots typing bad words on the internet. Because my birthday is at the end of the year, I started kindergarten younger than most of my classmates. As a result I was always the youngest, and until puberty, the shortest kid in my grade. Of course I got bullied! You know what? My parents didn’t know about 90% of it and I figured out how to deal with it. Yes, there are limits to what should be tolerated, but if all confrontation is removed or bubble wrapped into polite, non-offensive language, how are we going to learn to have confrontations and disagreements as we grow up? In the 1970’s life wasn’t bubble wrapped and it was fun. We had Jarts, lawn darts; a toy that was outlawed because of people too stupid to play without hurting themselves. We just threw those sharp metal things around the neighborhood willy-nilly, day and night. If someone lost an eye, well, they learned to be a hell of a lot more careful the next time. That’s the way life should be. Life is one big, stupid learning opportunity that kids of today are deprived of. Let’s see…kids of my generation, grew up, moved out of our houses and got on with things. These days kids never leave their parents home, and maybe it’s because they were never given the freedom to navigate and make mistakes in the real world. This entry was posted in Humor and tagged 1970's childhood, bubble wrap, childhood, humor, The Phil Factor. Bookmark the permalink. And how about not keeping score in sports? What? “We don’t keep score. There is no winner or loser.” Excuse me? You think the kids aren’t keeping score? You think the parents watching aren’t keeping score? You think the coaches aren’t keeping score? Everyone knows who won and who lost. But here’s your trophy for not winning a single game this season! Love the post and feel the same way about the way things “were” growing up. Sadly, though, it is a very different world today and “safety” has taken on a whole ‘nuther meaning for kids today. I long for the “way we were”. Bubble wrapped kids and helicopter parents it’s all so sad isn’t it?